Greek saxophonist and composer Dimitri Vassilakis was born in Athens 21 October 1961 and studied Chemical Engineering at the Athens University obtaining a Bachelor's Degree (1986). Until 1985 has leaded with brother Pantelis Vassilakis the avant gard new wave band Art Of Parties on bass/vocals. He then moved to London and studied saxophone, piano and composition at the London College of Music with the aid of the Onassis Foundation. He graduated with Honors with an additional Diploma in Classical Saxophone (1990) and won national UK competitions and the LCM Society prize. He continued his studies at the Royal Academy of Music (Advanced Studies in Jazz Saxophone and Composition) gaining a scholarship from the British Council and was awarded the LRAM diploma in jazz teaching (1991). 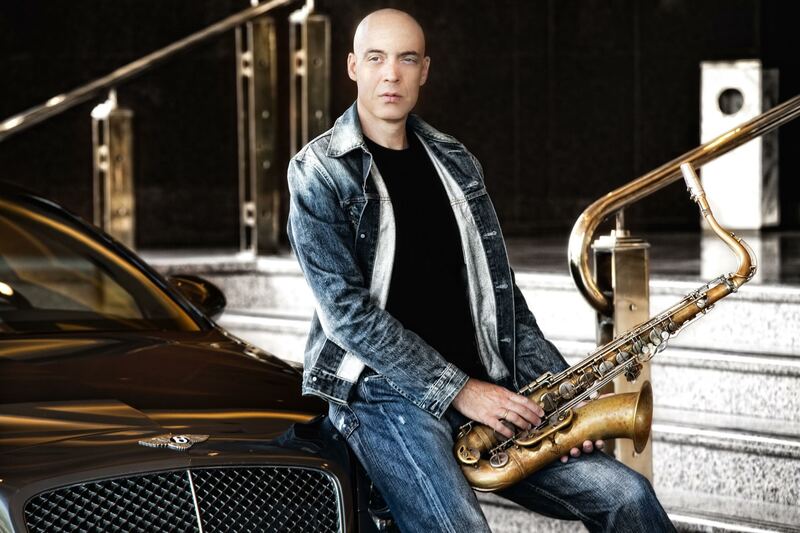 Being one of the key members of the International Association of Schools of Jazz and representative for Greece, he has traveled extensively playing at many Festivals and conducting workshops in the US, England, France, Germany, Spain, Ireland and the Balkans. He has taught at Ph. Nakas conservatory (1991-2000) directing the big Band and presenting a series of educational programs at the Athens Concert Hall. Has taught at the music departments of the Athens, Aristotle and Macedonia Universities (2000-2007) as a lecturer, while completing a Ph.D. and is the author of awarded educational books for saxophone and jazz. "Secret Path" was released (1999) by one of the most important and historic jazz labels based in London and New York: Candid Records. "Daedalus Project-Labyrinth" -produced by David Liebman- was recorded in New York with Ralph Peterson, Mark Johnson, Andy Sheppard, Theodossi Spassov and other top US, UK, Greek and Balkan jazz musicians - released 2001 and was voted 2nd jazz album of the year 2002 at the BBC Internet poll. "Parallel Lines" a jazz trio suite with Jeff "Tain" Watts on drums and Essiet Okon Essiet on bass was released 2006 and was presented round the globe with great success. On his latest recording "Across The Universe" (2011) he sings and plays songs from the Beatles Doors, Nina Simone and Chet Baker repertoire, to celebrate Candid Records 50th anniversary, recorded in New York with a cosmopolitan line up of top jazz men from all continents. His collaborating with Bentley produced the new compilation "Jazz For Bentley" (2011) that includes the best from his discography and new unreleased material. He has played at Birdland, Dizzy' s Club at Lincoln Center, Ronnie Scott' s, Sweet Rhythm, The Kitano, Zinc, Tonic, Cutting Room and other New York Clubs, at the "Onassis Cultural Center" in New York, at the Smithsonian Institute in Washington DC, during Jazz appreciation month at the American Museum of Natural History, at the Jazz Showcase, HotHouse, Barnes & Noble and Uncommon Ground Chicago, at the Athens Concert Hall, Onassis Cultural Center Athesn - Stegi, Niarchos Cultural Center, Lycabettus Theatre, Herodion Theatre, 2004 Athens Olympic Games, Delphic Games, at the Royal Festival Hall, Pizza Express, Purcell Room, Spice Of Life for the London Jazz Festival (2005/2007/2009) at Queens, Columbia College, DePaul, Skidmore and Yale Universities. Has worked on jazz and educational projects with the Hellenic Foundation for Culture, The British Council and the Greek Foreign Ministry. His recent talks and performances for TEDx Tokyo and Athens on "jazz democracy" was worldwide viewed and has created much interest and discussion. He has played with some of the best international jazz musicians such as: Jeff "Tain" Watts, David Liebman, Abdullah Ibrahim, Theodosii Spassov, Ralph Peterson, Marc Johnson, Dan Wall, Andy Sheppard, Essiet Essiet, Ron Affif, Adam Nussbaum, Ron McClure, Jamie Cullum, Sylvia Cuenca, Juliet Kelly, Alex Foster, Milcho Leviev, Tia Fuller, Kim Thompson, Craig Bailey, Deborah Davis, Rex Richardson, Nikolas Simion, Ed Schuller, and more. His albums and tours have received excellent reviews from publications such as the 'Jazz Times', 'All About Jazz', 'New York Press', 'BBC Music Magazine', 'Jazz Journal', 'Jazzwise', 'Jazz Heritage', 'Time Out', London Jazz Festival, Smithsonian Festival and from top jazzmen as Michael Brecker, Bobby Watson and David Liebman. He has performed for 2 Greek Presidents and leading a string quintet, for the official visit of the President of the US Bill Clinton to Athens (1999), at the Greek Presidential Residence. He is the first acclaimed international Greek jazz artist and in Athens has presented a live jazz Radio Program for Radio 3 also broadcasted by National TV NET, where he performed with and presented top Greek and International visiting jazz musicians. He was also the presenter of 'All that Jazz', a program on Channel 7, live from Athens jazz clubs and concert halls, with discussions on the history and aesthetics of jazz. Dizzy' s Club Jazz at The Lincoln Center! The Greek Gang! a jazz platform for young Greek jazzers, have played at the Hellenic Center in London and for the London Jazz Festival 2009 & 2012.